Driving Question: How can schools and teachers make project-based learning a reality for students? The importance of creativity and innovation within schools is supported by the research and writings of individuals from Daniel Pink to Sir Ken Robinson. Eduthink21 observes the foundations of this research and understands the importance of developing classrooms to prepare all students for the challenges of the 21st century. Over the past decade, in an independent lab school, we have designed a learning model to move from theory to educational practice. Our work includes research with diverse populations of children, ranging from socio-economic need to diverse learning abilities. To highlight a few of our findings, students have exhibited large inquiry, math, and science vocabularies, a questioning mindset, persistence, creativity, and high nonfiction reading comprehension. Student engagement is an important aspect of teaching and learning. Let’s face it, educators have to compete with the constant entertainment at the fingertips of the 21st century student. The planning of a project must begin with student interests. There is no universal curriculum for project-based learning, we take a one-size-fits-one approach. If you have yet to observe student interests prior to beginning a project you might ask; where do I begin? We have developed Macro and Micro Planning Forms, to guide teacher collaboration and initial brainstorming. While we might not know where student interests will lead, we can map ideas and possibilities surrounding the standards and content we must teach. Surprisingly, once piquing student interests our teacher-directed content often aligns with student curiosity. One way we initially pique student interests is through our classroom environment. We sensory provision the classroom, to engage the five senses through project-related learning centers. Sights, sounds, smells, and items for exploration can often lead to the development of student interests. The research of neuroscientist Mathis Gruber of the University of California Davis, finds that we retain more information following a high curiosity state. According to these findings, piquing student interests is crucial to the retention of content knowledge to follow. An interest sparking experience can include field-work, a presentation by a community partner, the introduction of a driving question, or a teacher in costume that is complemented by a sensory provisioned classroom. We also advocate classroom wonder walls. This promotes a classroom of inquiry, while providing an assessment tool to gather information about initial and ongoing student interests. Educators must understand the background knowledge of their students, to serve as a starting point for deep teaching and learning. A classroom project wall is great place to document and record student’s background knowledge. The teacher can then determine if he/she must set the stage for deeper learning and identify the depth of knowledge the classroom should receive at the onset of a project. The authenticity of learning is crucial, as it helps students to apply learning to the real-world. We believe in building a library of community partners that pair with a wide range of project topics. While this can be challenging, we begin with a school’s stakeholders. A school’s families often have a range of careers, talents, and hobbies that complement project work. Community partners provide real-world problems to solve during a project. We engage with these partners through field-work, in-person or skype interviews, letters, and e-mails. In addition to the real-world application of learning, community partners also provide exposure to careers and fields of study that influence student’s thoughts around college and career planning. Teachers have learning standards and content requirements they must meet. So how can we observe student’s interests too? We believe that both can co-exist. Once we engage students and pique their interests, content can be shared with higher retention. We can then allow students to deviate from teacher-directed curriculum, as they make connections and dive deeper into various related topics. Throughout each project, students complete capstone work that is of their choosing. It is often inspired by or connected to teacher directed learning concepts. A research guide, written document, student blog, labeled model, and presentation allow each child to drive their learning through the 4Cs (critical thinking, creativity, communication, and collaboration). Meeting the needs of all learners is important to ensuring the retention of information. We believe in documenting learning through various formats, ranging from those that speak to the logical-mathematical student to the musical learner. Documenting learning and research is also important for ongoing student reflection, particularly at the end of project work. Tools such as a project wall, classroom data book, or student blogs are meaningful ways to record student learning. Due to the increasingly complex and rapidly changing world, we believe that students need to learn empathy, compassion, and develop social-entrepreneurial dispositions in order to solve complex problems. Through each project, we tie a change-making opportunity to our project work. Often this is related to the real-world problem presented by our community partners. All students learn how they can make a difference and positively impact the world, no idea is too big or small. The development of the 4Cs (critical thinking, creativity, collaboration, and communication) are central to our learning model. These dispositions are developed throughout the phases of our project work, however they are culminated through final reflections, analysis, student oral presentations, and individual capstone work. We share our findings with community partners and all school stakeholders. Subscribe to our blog to receive upcoming posts, which will provide an in-depth exploration of the learning model phases. We will begin by investigating Phase I of our learning model, Planning and Sensory Provisioning. We will share tools for team planning, our Macro and Micro planning forms. Photographs of provisioned classrooms with detailed examples will also be shared. 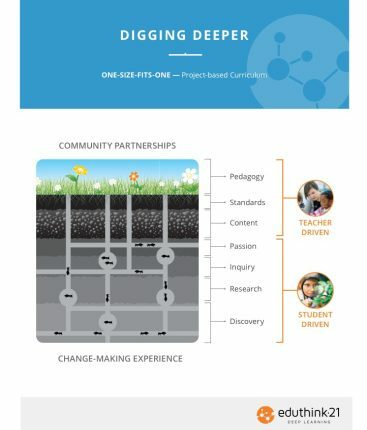 Take the next step to making project-based learning a reality for your school or classroom by joining our learning community!